That's right, kid. My car. My rules. Let's ride. After getting the things that needed getting, we arrived at a hunger pang. First, please note. 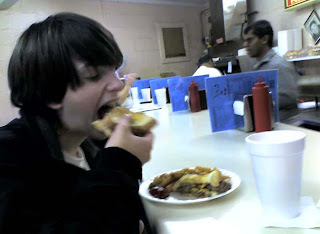 My son hates eating out. There was a time when El Jinete persuaded him that the time spent at the restaurant was worthwhile, but once he realized that they also had take out, not even Mexican food will persuade him from gaming central. I'm considerate enough to offer an option. "What do you want? Burger or BBQ?" Good... right where I want him. 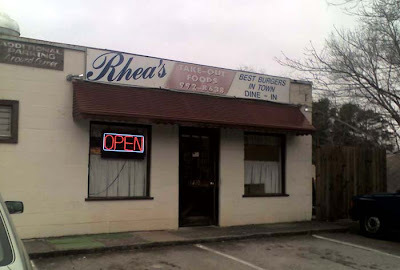 And, so it happens that we arrive at Rhea's, a 20 something year tradition in Roswell. 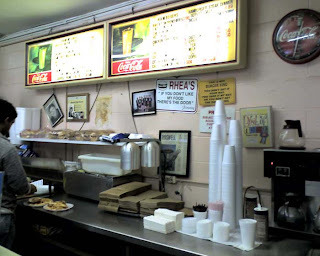 Rhea's is built into a corner of an old service station. It has maybe 10 bar stools and three 6-seat tables, with the grill visible from the counter. It's concrete block walls are a nice shade of "faded, somewhat stained" white, and whatever atmosphere that might be considered desirable is added by the scarcity of space and its triangular shape. For those that haven't ventured here, you might worry that the sign that reads "If you don't like my food, there's the door" would suggest limited consumer input. Not so. You tell Jimmy how you want it, that's what you'll get. 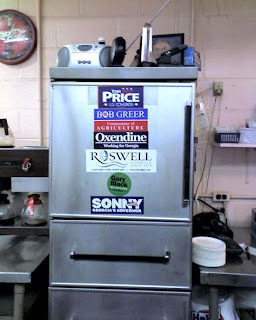 Aside from its odd triangular shape, the restaurant also leans to the right, as witnessed by the bumper stickers on the cooler. Yes, the radio on top is operational, and, in fact, was operating, adding seasonal music to the ambience. After all was said and done, my son re-learned that not all burgers must come from a bag, as his double cheeseburger (plain with ketchup) served on toasted bread arrived hot off the grill with fries on a paper plate. Would he dare try something so astonishgly new? So, when all was said and done, Brian did have a final say on the experience, no doubt clouded by his angst to return to his bunker. "Dad, that was so ghetto." 1. Are the burgers really the best in town? 2. Is Rhea's 2 (across from the Jag dealer) related and of the same quality if it is? 1. Within a one mile radius, certainly! It's a grilled burger; hard to go wrong. 2. Yes, they're related. This location is better. 3. As long as you don't drive your car inside the restaurant, you're (probably) safe.